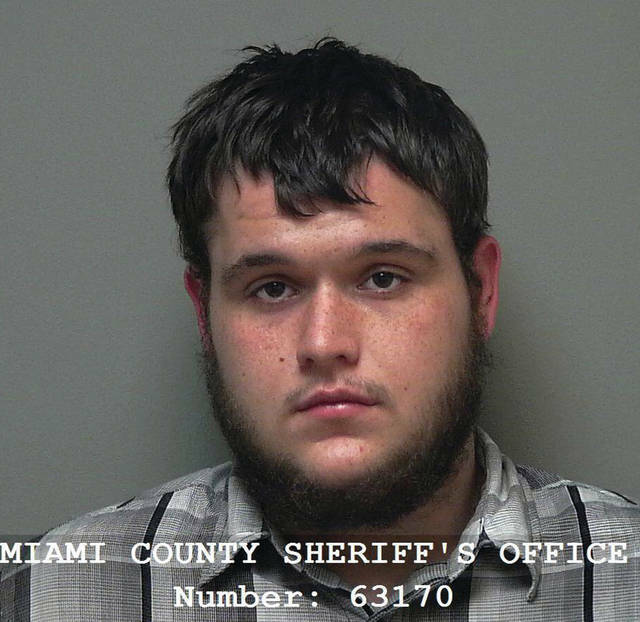 MIAMI COUNTY — A Piqua man accused of assaulting his two-week-old infant son was back in Miami County Municipal Court this week. Brent W. Hennon II, 20, is currently facing a second-degree felonious assault charge after being accused of assaulting his son to the point of the child needing medical care. A preliminary hearing for Hennon was scheduled for Wednesday. He signed a time waiver this week in Miami County Municipal Court, and a new preliminary hearing is now scheduled for Dec. 26. Miami County Municipal Court Judge Sam Huffman increased Hennon’s original $50,000 cash or surety bond to a $500,000 cash-only bond. Hennon is continuing to be held at the Miami County Jail. • A Piqua man received a fine for a reduced charge in connection with a drug-related search warrant that took place in August. Anthony J. Benbow, 28, received a fine and 30 days of suspended jail time for third-degree misdemeanor criminal mischief, amended down from first-degree misdemeanor permitting drug abuse. Benbow was originally charged with first-degree misdemeanor permitting drug abuse on Aug. 17, in connection with a search warrant executed on the 1300 block of Brook Street in Piqua on Aug. 8. A narcotics search warrant was executed at that residence. Evidence of drug trafficking and drug abuse was recovered from the residence, according to Piqua police reports. • A woman received a fine after being found guilty of falsification and inducing panic. Katrina Marie Fitzgerald, 22, address unknown, received a fine and 30 days of suspended jail time for first-degree misdemeanor falsification and first-degree misdemeanor inducing panic. Fitzgerald was charged in connection with a report of an OVI on Nov. 22, in the area of Martin and Oak streets in Troy. Fitzgerald and another individual were located inside a vehicle, and Fitzgerald was passed out. She was transported to the Upper Valley Medical Center before being incarcerated at the jail. An additional charge of third-degree felony tampering with evidence was dismissed, and a charge of fourth-degree felony possession of drugs was bound over to Miami County Common Pleas Court. Fitzgerald is still being held in the jail on $1,500 bond for the drugs charge. The other individual, Joshua Centers, 29, of Sidney, was charged with an OVI and first-degree misdemeanor inducing panic in connection with this incident. His case is still open in municipal court, and he is scheduled for a pretrial conference on Dec. 20 in municipal court. Centers is also continuing to be held in the jail on $5,500 bond. • Douglas E. Baker, 30, of Piqua, received a fine and 30 days of suspended jail time for first-degree misdemeanor possession of a drug abuse instrument. • Fontaine Ann Caldwell, 21, of Huber Heights, received a fine and 30 days of suspended jail time for fourth-degree misdemeanor unauthorized use of property, amended down from first-degree misdemeanor theft. • Deandre L. Clay, 39, of Troy, received a fine and 60 days of suspended jail time for first-degree misdemeanor theft. • Teresa L. Kenney, 57, of Troy, received a fine and 180 days of suspended jail time for first-degree misdemeanor assault. • Kimberly S. Kinsler, 47, of Dayton, received 10 days in jail, 170 days of suspended jail time, and a fine for first-degree misdemeanor possession of drugs, amended down from fifth-degree felony possession of drugs. • Matthew L. Maier, 34, of Covington, received, two years of probation, a fine, and 180 days of suspended jail time for first-degree misdemeanor theft, amended down from fifth-degree felony theft. • Justin C. Montanez, 33, of Piqua, received 10 days in jail and a fine for fourth-degree misdemeanor criminal trespass and 120 days of suspended jail time for first-degree misdemeanor possession of a drug abuse instrument. • Brian A. Nelson, 30, of Piqua, received one year of probation, two days in jail, 28 days of suspended jail time, and a fine for fourth-degree misdemeanor disorderly conduct. • Timothy L. Roth, 35, of Piqua, received one year of probation, a fine, and 180 days of suspended jail time for first-degree misdemeanor aggravated menacing, first-degree misdemeanor assault, and first-degree misdemeanor theft, all separate charges from different incidents. Roth was originally charged with assault in connection with a male victim being found on the ground on the 100 block of North Main Street in Piqua on Sept. 27. • Cory D. Sowers, 24, of Troy, received a fine and 30 days of suspended jail time for second-degree misdemeanor obstructing official business. • Quinten Z. Wilkins, 23, of Vandalia, received a fine and 30 days of suspended jail time for fourth-degree misdemeanor unauthorized use of property, amended down from first-degree misdemeanor theft. • Bryon D. Wilson, 37, of Piqua, received one year of probation, 180 days of suspended jail time, and a fine for first-degree misdemeanor possession of drugs, amended down from fifth-degree felony possession of drugs.